Always aiming to offer its customers the highest levels of sales and service available, global mechanical seals manufacturer EagleBurgmann provides ongoing training to its employees and customers. With this aim in mind, EBKSA has invested heavily in various training processes, both in-kingdom and globally, to ensure the continuous development of staff. 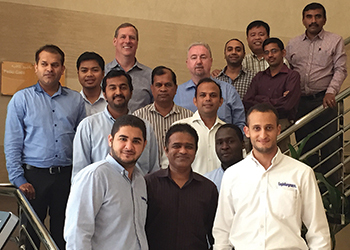 In the last year alone, the company has held the famous Miller-Heiman Training Programme for its sales and service personnel at the Park Inn in Al Khobar in Saudi Arabia; an in-depth and hands-on training for service engineering staff in Germany and Dubai. A HSE staff training was held in Germany; application engineering staff training in the UAE and Germany; engineering product training for sales engineers in Japan and Germany; sales and logistics staff training in Turkey; and training for HR personnel in Germany, as well as basic first aid, IOSH working safety, basic firefighting and forklift training was held locally. In addition to these, EB also offers customer training, including intensive onsite training and workshops in-kingdom, as well as standard and bespoke training courses in Germany and Japan, all designed to help staff better understand the latest EB products and technologies available to them. Saudi Aramco, Sabic, Sadara, and Satorp are amongst a long list of its satisfied customers.